MX3D is an R&D startup focused on 3D-printing metals and resin in mid-air, without the need for support structures. They pride themselves in "robotic technology with which we can 3D print beautiful, functional objects in almost any form." Now they say "We are going to print a steel bridge in Amsterdam." The robots will be printing in steel and the robots will print that bridge over water in Amsterdam. The project team sees the metal bridge as serving as a showcase for present-day capabilities in software, engineering and design. Key to their progress has been robotic 3D printing technology that makes it possible to draw in mid-air. They will use what they describe as "multi-axis" industrial robots. They said that now, together with an advanced welding machine, they can print with metals such as steel, stainless steel, aluminium, bronze or copper without the need for support-structures. Adding small amounts of molten metal at a time, they print lines in mid-air. Fast Company reported that "MX3D's bridge will be made of a new steel composite that the University of Delft created. As strong as regular steel, it can be dolloped out by a 3D printer, drop by drop." The plan: "It is hoped that the robots used will print their own supports and gradually move across the water, creating the bridge as they go. The robots will begin printing the bridge on one side of the canal and will create rail-supports as they go," according to video notes published on Friday. They will be able to gradually slide forward on supports, literally creating the bridge upon which they are crossing the canal. "What distinguishes our technology from traditional 3D printing methods is that we work according to the 'printing outside the box' principle," said the CTO of MX3D, Tim Geurtjens, "By printing with 6-axis industrial robots, we are no longer limited to a square box in which everything happens." The Joris Laarman Lab site commented: "3D printing like this is still unexplored territory and leads to a new form language that is not bound by additive layers. Lines can be printed in that intersect in order to create a self-supporting structure. This method makes it possible to create 3D objects on any given working surface independently of its inclination and smoothness in almost any size and shape." 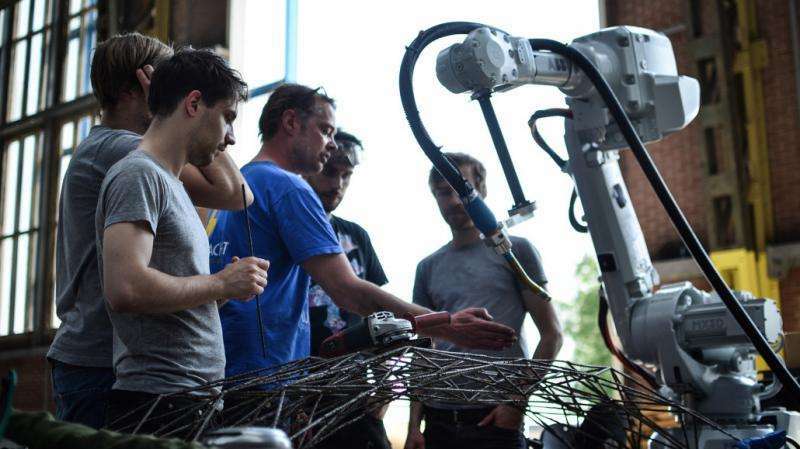 A number of groups are collaborating with MX3D on this project, including, among others, construction company Heijmans, the Joris Laarman Lab, software company Autodesk, ABB Robotics, and the Amsterdam City Council. Laarman, when asked how the idea for the bridge came about, said this, on the Heijmans site: "We were at the airport in San Francisco, on our way to a presentation about MX3D, and were brainstorming about what the ultimate poster project would be for showcasing all facets of our technology. We came to the conclusion that a bridge over the old canals of Amsterdam would be a fantastic metaphor for connecting the technology of the future with the city's historic past." "In 2017, Dutch designer Joris Laarman will wheel a robot to the brink of a canal in Amsterdam. He'll hit an 'on' button. He'll walk away. 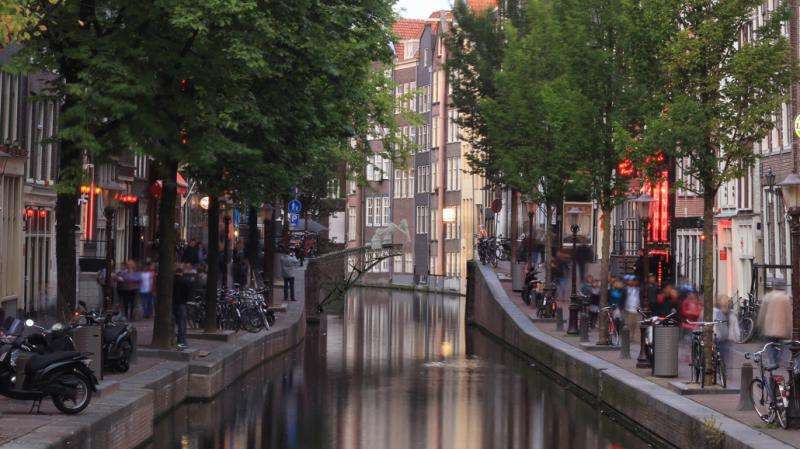 And when he comes back two months later, the Netherlands will have a new, one-of-a-kind bridge, 3-D printed in a steel arc over the waters. This isn't some proof-of-concept, either: when it's done, it will be as strong and as any other bridge. People will be able to walk back and forth over it for decades." Brownlee added, "That's the plan, anyway." In September, there will be a visitor center where people can follow the progress of the project, and the City of Amsterdam will announce the exact location of the bridge. What measures do they take against corrosion? Welding has a bad habit of altering the microstructure of the steel alloys and driving the additives out of phase from the iron. It means eg. stainless steel tends to rust at the seam and around where it's been welded - and the whole bridge is essentially one huge weld. One could spray-paint the entire thing with zinc. Its high time architecture became much more creative. I find todays age of repetition and boxes to be mind numbingly depressing. Growing architecture piece by piece. Could be right out of an Ian Banks SciFi novel. The future (of manufacturing) has really arrived. There's still a ways to go to get the structure smooth. I wonder if one could add a second robot that holds a small piece with a hole in place when the other one does the welding so that the drop has a predefined form. (Or alternatively just have a second robot a ways behind and polish it in a postporcessing step). Unless these issues can be overcome, the method will be little more than a curiosity. The big advantage here is that you can build any geometry. Making tools for specialized geometries is expensive (and inefficient if they are only used once). And the amount of manpower you need is also zero (which is a big cost savings). This method of manufacturing is supremely flexible. Unless you want to have "same old, same old" everywhere it's the way forward. The only reason we have drab uniformity in everything (buildings, clothes, cars,.. ) is because it was cheaper to do it that way. That is changing and we actually might get some aesthetics back into our lives.. True, but pre-fabrication is still vastly cheaper and faster for the same utility than building the thing in-situ, for the same reason that plastic injection molding is literally a million times cheaper than manufacturing parts by extrusion printers. What do you think you'd gain from unlimited geometry if the bridge is going to be many times more expensive and slower to manufacture regardless? How much more would you pay for "aesthetics"? The device is basically making the bridge geometries out of straight rods that are attached at their endpoints, because that's the stable configuration for making load bearing trusses. If you make them curvy, you introduce flex and your bridge becomes wobbly or buckles under load. There's no sense in constructing these rods by welding one drop at a time. If you could spool them out of a roll, cut and then weld the end in place, that would speed up construction immensely. How much more would you pay for "aesthetics"? Take a city in the US (any city)...and then compare to Amsterdam. 'nuff said. As for cost. What are the extra costs here? Where exactly are the savings going the old route when you have to additionally make molds, transport and assemble the stuff? The material cost is the same. And the energy cost are even more the traditional way. Then you pay for storage and wages. Sounds a LOT more expensive to me. It isn't. Making MIG welding wire is much more expensive than rolling out steel girders. Bridges haven't been made of cast iron for about a hundred years now. Steel bridges are made of beams that are rolled from very large billets by stretching them out, rolling them into shape, and then cutting to length. They're then transported where needed and riveted together. Concrete bridges on the other hand are already sort-of 3D printed, because the concrete is pumped into a moving mold that is shifted as each layer cures. Some parts, like the bridge deck, are manufactured as whole element assemblies offsite, and then simply lifted into place. If you look at how bridges were historically made, and how they are made today, it quickly becomes clear that you can't actually print a bridge millimeters at a time if it's going to span more than a few meters, because the unfinished halves can't support themselves beyond that. Eventually you need to build a scaffolding before you can build the bridge, and at that point the advantage is lost because you essentially have to build the bridge before you can set the robots to work. Besides, when the bridge is constructed of elements made off-site, the factories that produce them can build all the elements simultaneously rather than working from the two ends of the bridge inwards. When the bridge span is split into a hundred parts, each being constructed in parallel, it takes a hundred times less time to complete. For any larger bridge, building linearily one bit at a time before starting another, would mean it takes decades to finish. You're right that printing a bridge is going to be much more expensive and slower, but we have to start some where. If we always made things the same way, then we couldn't continue moving forward. Before 1913 it was much cheaper to have a horse and buggy, then it was to have a car. Had we stopped with Karl Benz's car because it was slower and more expensive then the horse, things might be different today.